Refrigerant is evacuated from each vehicle in accordance with applicable regulations or contracted for refrigerant removal with a licensed vendor. Records are maintained for off-site refrigerant disposal/reclamation. Section 608 & 609 of the Clean Air Act Amendments, passed by the US EPA in 1993, require service practices that maximize the recycling of chlorofluorocarbons (CFCs such as R-12) and hydrochlorofluorocarbons (HCFCs such as R-134a) during the service of air conditioning equipment. The regulations also set certification requirements for equipment, restricted the sale of refrigerants, and established safe disposal requirements. The rule governing the existing products will also apply to the R-1234yf refrigerant. Venting Prohibition Section 608 prohibits intentionally releasing (also called venting) ozone depleting substance (ODS) refrigerants and most alternatives including all HFCs, HFOs, and their blends, while maintaining, servicing, repairing, or disposing of MVAC equipment. CO2 refrigerants are exempt from the venting prohibition. R-134a is an HFC and R-1234yf is an HFO. 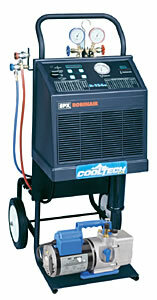 1) Purchase only certified refrigerant recovery equipment. a. Register the equipment with EPA upon initial purchase. 2) Maintain records of the recovered refrigerant, date sent and receiving reclamation service provider. 3) Recharge of AC system performed by MACS certified technicians. Evacuation only does not require the service technician to be MACS certified. 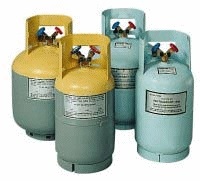 The Clean Air Act Amendments of 1990 prohibit releases of all refrigerants. The venting ban became effective January 1, 1993. In addition to the release ban, facilities performing AC repair work must use EPA-approved refrigerant recovery/recycling equipment and certified AC service technicians must complete all repair work. Evacuation only does not require the service technician to be MACS certified. Only service work, such as recharging of AC system with refrigerant, and/or the purchase of R-12 refrigerant require the technician to be MAC certified. R-134a refrigerant may be purchased by non-certified buyers. HFO-1234yf is the first in a new class of refrigerants acquiring a global warming potential (GWP) rating 1/335th that of R-134a and an atmospheric lifetime of about 400 times shorter. It was developed to meet the European directive 2006/40/EC that went into effect in 2011 requiring that all new car platforms for sale in Europe use a refrigerant in its AC system with a global warming potential (GWP) below 150. Download R-1234yf article. HFO-1234yf, which has a 100-year GWP of 4, could be used as a "near drop-in replacement" for R-134a, the current product used in automobile AC systems, which has a 100-year GWP of 1430. This means that automakers would not have to make significant modifications in assembly lines or in vehicle system designs to accommodate the product. HFO-1234yf has the lowest switching cost for automakers among the currently proposed alternatives, although the initial cost of the product is much higher than that of R-134a. Initially, the refrigerant is expected to be about ten times more expensive than R134a. The higher retail cost of the product should be an incentive in the recovered product market for auto recyclers. The product will be handled in repair shops in much the same way as R-134a, although it would require different equipment to perform the service. One of the reasons for that is the mild flammability of HFO-1234yf. Another issue affecting the compatibility between HFO-1234yf and R-134a-based systems is the choice of lubricating oil. 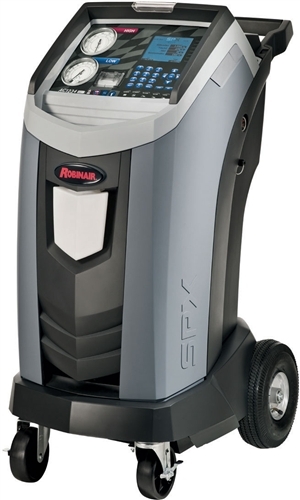 A new piece of recovery equipment will be required to capture the refrigerant. Contact the Motor Air Conditioning Society at http://www.macsw.org/ to acquire a reprint of the technician’s MACS Certification card or re-take the online program to re-certify (at the same website) or attend an I-CAR class at your local community college. If the refrigerant is recovered and then leaves the service establishment, such as in storage containers, it must then be reclaimed to the ARI 700-88 standards to assure purity for re-use. On-site re-use is permitted. Records should be maintained for off-site refrigerant disposal/reclamation that includes the amount of refrigerant, the date sent, and the facility that received the refrigerant. Proof of technician certification should be readily available onsite. The waste refrigerant does not need to be included in the facility’s hazardous waste generation total as long as it is recovered and handled by a MACS certified technician and disposed/reclaimed with a qualified reclamation/recycling service.